Woodland Mansion Village Spawn Seed for Minecraft xbox one on a large map. Tons of coordinates included below. 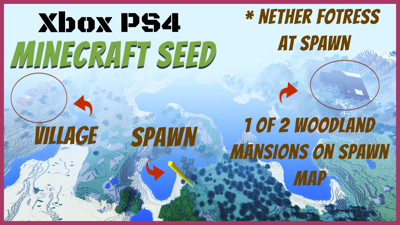 This seed spawns you right close to a Woodland Mansion set up beautifully in the mountains! and then you also have a Accacia village close by. There is another woodland mansion at the top of spawn map. You'll find a nether fortress right at spawn point if you setup a portal there. I also found cords for a desert temple. The End Stronghold is really close to spawn, though just outside spawn map. There is a dungeon in there, as well as 2 libraries, and even a abandoned mineshaft. The End Stronghold spawns in a ravine and there are cords for that included. Basically an awesome map if your looking for a woodland mansion village spawn seed. Remember when you are creating this seed on Minecraft Xbox One Edition, you need to input the seed # including the "-" if there is one. You also need to match the biome scale and map size so that everything will come through exactly the same as I present it here. If you don't use the same map size I can't guarantee structures will be there. If you like this seed leave a comment below or subscribe to my youtube channel. I post seeds regularly. Coordinates are also included in the comments on youtube vids, and people often share cords they have found that I didn't.